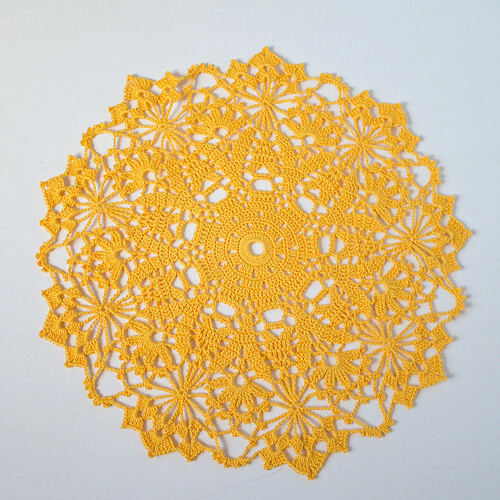 Are you in doily withdrawal? 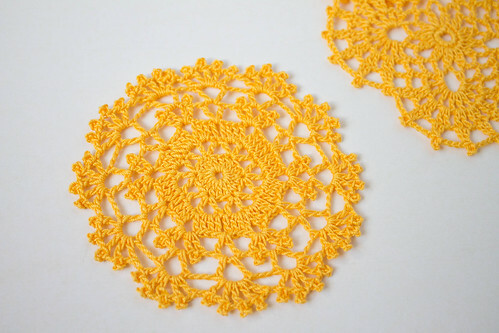 If so, you can take a gander at this doily and coasters set I made for my friend's bridal shower gift! 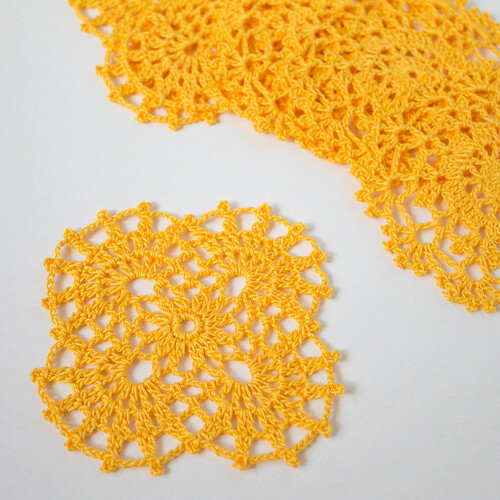 The crochet specifics: size 10 thread, 1.5mm hook, and the pattern Round Crochet Doilie. Using two patterns from the Japanese book Crochet Lace in Antique Style (thanks again Ale! ), I made six coasters (three from each pattern) with size 10 thread and a 1.65mm hook. I think the doily and the coasters makes a pretty cute little drink set! 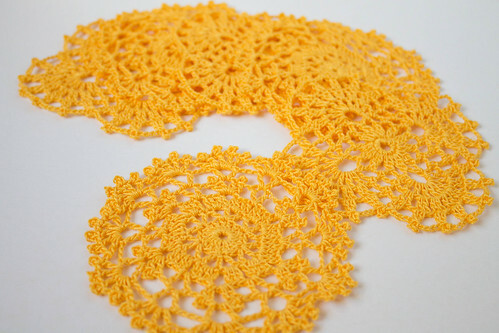 I could see a cute tea pot on the doily with some matching little tea cups on the coasters... mmmm tea... I think I hear Earl Grey calling my name. Coming! Have a fabulous day my friends! What a gorgeous doily and coasters, Kate. The colour is one of my favourites too, that golden yellow. That's a wonderful gift for your friend's bridal shower! 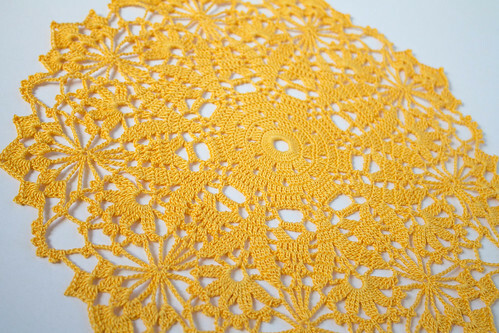 I like the shape of that last little doily with four circles. I can just see a dainty Japanese teapot on that one! What a pretty set you made. They will make a great gift. ...you are really welcome, Kate !!!! These are really gorgeous. Do you block them when you're done crocheting? Yes I do! I forgot to mention that part! Yes, I pin them out with T pins, spray them with water and let them dry overnight! Easy! Thank you Debi!! I can't get enough that yellow color! Parabéns em crochet pelos belos trabalhos ! Thank you so much Sonia! 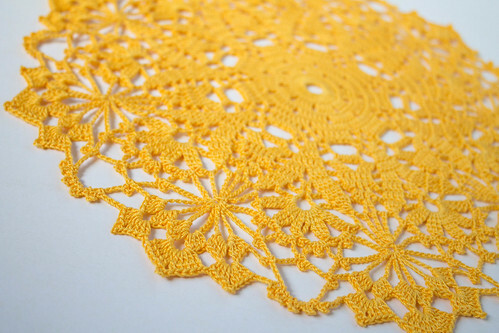 You have some beautiful crochet work on your blog too! I want to make something like this for my niece who just purchased her first home, but I want to use thread and an F hook. Possible? I'm so sorry it's taken so long to reply!! An F hook may be too big for size 10 thread like I used... However, I have used a D hook with size 3 thread, which I thought worked pretty well! The best thing I can suggest is to just experiment with the pattern you want to use, try different hook sizes and see what you like!